Internal grinding of flange parts or spindles up to 1,300 mm long – for the new Studer S141, both are no problem at all. The machine, first unveiled in Autumn of 2014, is the vanguard of a new machine platform for universal internal grinding, to be followed by additional sizes of models at the EMO 2015. Along with various new functions, the S141 also features the latest FANUC CNC 31i-B, which in turn offers numerous improvements over its predecessor model. With the S141, Studer is planning to win over a new market segment. The universal internal grinding machine, which will be available in additional sizes at the EMO 2015, is ideally suited for grinding long workpieces up to 1,300 mm, such as spindle shafts, spindle housings, rotor shafts, or axes. Whereas small components are only mounted in the chuck, long pieces can also be supported by a steady rest. The totally reengineered S141 is already impressive on paper: The maximum internal grinding length is 250 mm and the external length is 150 mm. The swing diameter above the table is a maximum 400 mm, and the workpiece weight is allowed to reach 250 kg. Also with the S141, the name Studer stands for precision, primarily based on the Granitan® machine bed with its well-known favourable thermal and dampening behaviour. The large distance between the guideways and the very rigidly constructed slides provide great stability, which is indispensable for dynamic precision machining. What's more, all precision-related components are temperature-stabilised. Performance-boosting innovations such as the patented StuderGuide® guideway system provide for quick, high-precision axis movements. Especially because all the axes are equipped with linear drives. The grinding spindle turret with up to four grinding spindles (including a maximum of two external grinding spindles) is directly driven and therefore incredibly fast. For axis-parallel grinding of cones and tapers, the workpiece table can be automatically swivelled. For any application, Studer has the appropriate truing strategy on up to two truing stations. In addition, there is an integrated probe which can determine the longitudinal position axially and radially. On the controller side, Studer relies on proven technology and solid experience, as Wolfgang Labus, Head of Product Engineering, emphasises: "As far back as 1992, we have working in a close partnership with FANUC in the field of control and drive technology. In particular, we appreciate the high reliability of FANUC hardware and software, which also applies to newly-launched products. That is why we did not hesitate to also equip our new development S141 with a relatively new FANUC 31i Model B controller generation." As with the FANUC controls used for Studer machines in the past, the version selected is also equipped with an integrated FANUC "Panel i" industrial PC, on which Studer software runs with its own user interface. This includes StuderPictogramming, for example, on which the user arranges the individual grinding cycles and the ISO code is generated by the PC. The software for the Studer Quick-Set grinding disc measurement reduces the truing cycles by up to 90 percent. The StuderWIN and StuderSIM programs developed by Studer are suitable for various applications in internal grinding and enable secure programming of all basic cycles for grinding, truing and process-supportive measuring. Above all, StuderWIN stands out thanks to micro-functions, with which grinding and truing routines can be freely programmed, in order to optimise the grinding process. Software options for the grinding technology calculation, optimised truing, as well as contour, thread and form grinding further enhance the machine's functionality. The developments on the software and control side have continued over the past few years, which benefits the S141. Thus, measurement, contact detection, loading and handling systems are linked to the FANUC controller, thus enabling it to be controlled directly from within the user interface. Wolfgang Labus explains: "FANUC gives us the opportunity to fully integrate our gauging and sensor technology for process monitoring as well as contact detection and automatic balancing systems into the controller, which allows for user-friendly, standardised programming of the various systems." The 15" touchscreen of the FANUC 31i-B also facilitates the intuitive operation and programming of the machine. All control elements are usefully arranged clearly and ergonomically. For easy set up close to the grinding process, Studer has developed a process-adapted hand operation device which seamlessly works with the FANUC CNC. The S141 also stands out thanks to its advanced drive technology – with linear motors in all axes. "Unfortunately, not from FANUC", as Wolfgang Labus notes. "It would naturally be ideal if everything came from one company and was installed in the switch cabinet by a group of suppliers. But it also demonstrates that in exceptional cases, FANUC has the capability of allowing third-party products and makes the relevant technical parameters available in order for all the drive elements to be optimally matched to the controller." During the development of the S141, there was not yet a matching linear drive available from FANUC. But that could change in the near future, mentions Antoine Ferrari, the FANUC Sales Engineer responsible for Studer: "The LiS D1 linear motor series we just developed has a considerably more compact footprint and therefore a higher performance density. The new 4500 N-model, for example, is 50 mm slimmer than the previous model." Based on its partnership of many years, Studer has great in-house FANUC expertise. Yet for new developments such as the S141, according to Wolfgang Labus, the control and drive specialists from the Swiss FANUC location in Biel have been on board from the beginning. Typically, the drives are jointly specified and the control equipment is discussed. "The support that we receive there is truly superb", in the opinion of the Head of Product Engineering. "Recently we even received a complete controller on loan in order to enable testing of interfaces and other specifications on the CNC in advance of prototype manufacturing." This ensures that all basic functions are in sync at an early stage. When a new machine goes into series production, there are usually adaptations needed, e.g. interfaces for data handling of the customer. Wolfgang Labus further specifies: "More and more customers want to know which workpiece can be ground when and in what quality. They want to have the machine data and measurement findings documented, whereby matching interfaces must be available. This is a requirement that will become increasingly more important in the future." FANUC has prepared for this. In the Model B control generation, there are nearly a dozen interface protocols available, allowing the CNC to communicate with many peripheral devices. In addition to the standard Profibus, recently ProfiNET has become available as well. What's more, FL-Net, EtherNet/IP, Fast Ethernet, MOD-Bus and further protocols are supported. Especially for the peripheral installations, the new 3xi Model B CNC series has several advantages to offer. Its high-speed PMC (an integrated PLC) is three times faster than the previous model. And the available program memory is also increased threefold. For sophisticated machining tasks, it is tremendously helpful that up to five PMC channels are available in the 31i-B, enabling the simultaneous execution of independent PMC programs at the highest speed. Responsible for the boost in output are its fast PMC processor and the data transfer between the CNC and PMC, accelerated thanks to the new bus technology. Antoine Ferrari points out the FANUC I/O-Link i, which is considerably more powerful than its predecessor. It can transmit twice as many PMC-I/O signals per channel, and therefore 24 groups can now be connected instead of 16. Among other things, the enhancement has positive effects on the integrated safety function, "Dual Check Safety": A single I/O-Link i cable is sufficient to transmit the secure signals. There are also new diagnostics opportunities associated with the use of the I/O link i. Via so-called error-point detection, the user can determine whether a digital output is defective or interrupted. On the CNC screen, the source of the error is displayed, which extremely reduces the diagnostics time interval. As part of preventive maintenance, the "leakage detection function" for monitoring leakage resistance levels is also interesting. Impending motor faults can thus be detected at an early stage and replaced by maintenance staff. As a sign for energy efficiency, Studer machines bear not only the "Blue Competence" label of the German Engineering Federation (VDMA) , but its own BluePlus label, which stands for six comprehensive measures that lead to the reduction of energy consumption by the machines. Wolfgang Labus explains: "We achieve the improvements primarily through the use of our optimised software, as well as with design measures in the field of coolant supply and the extraction system. The use of energy-optimised electrical components – promoted by FANUC in the field of control and drive technology – is part of the BluePlus concept." On the hardware side, for example, through the use of state-of-the-art high-performance electronics, FANUC was able to reduce the power loss of the drives by another ten percent. At the software level, the user, for example, can select the desired energy-saving level using the "Energy-Saving Level Selection Function". Depending upon the machining requirements, the user is free to choose between full output and optimised energy utilisation, which generally results in somewhat slower machining. The additional S131 and S151 will be launched equipped with the FANUC CNC 31i-B as well. 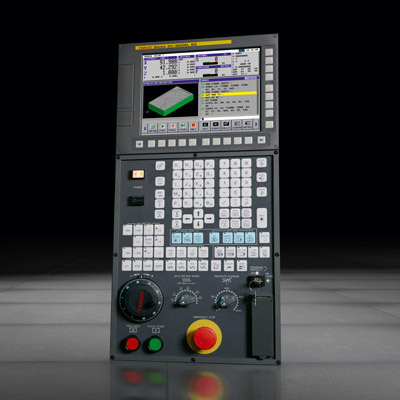 But Wolfgang Labus still has his sights set on an additional new FANUC CNC, the compact 0i-F CNC: "That is an additional alternative for the lower-end segment of our various type series that only have a few axes and do not require a multi-channel capability." With the 0i-F, presented for the first time at the AMB 2014, the CNC world market leader unveiled its "Seamless Concept". This states that all FANUC CNC controls are built according to a unified standard and have comparable operating instructions. It facilitates the design of modularly-configured machine series, operations, maintenance and service. Fritz Studer AG of Steffisburg, Switzerland, has some 800 employees and, together with the German companies Schaudt and Mikrosa, belongs to the circular grinding technology group within the United Grinding Group. Studer can look back on over 100 years of experience in the development and production of precision circular grinding machines. With approx. 22,000 delivered systems, Studer is considered the market and technology leader in universal, external, internal and noncircular grinding. The product range encompasses not only standard machines but also sophisticated systems solutions in high-precision circular grinding for the machining of small and medium workpieces. Studer also offers software, systems integration and a vast portfolio of services. Its customers include companies from machinery, automotive, tool and mould engineering, from aerospace, pneumatics/hydraulics, electronics/electrical engineering, medical technology, the clock and watch industry, along with custom manufacturing.